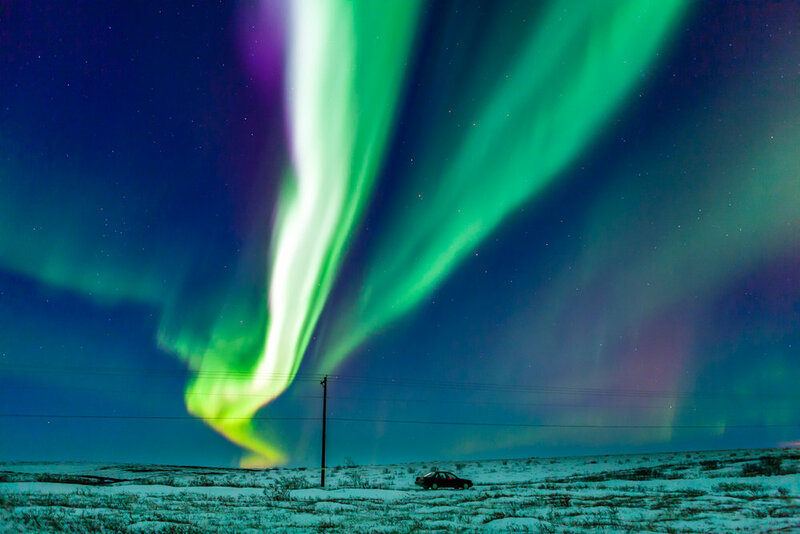 You can't travel in the low arctic in winter and avoid taking photographs of the aurora borealis. On a clear night if you stay out late enough--if you and your gear can tolerate the cold it will inevitably blow up for a little while. 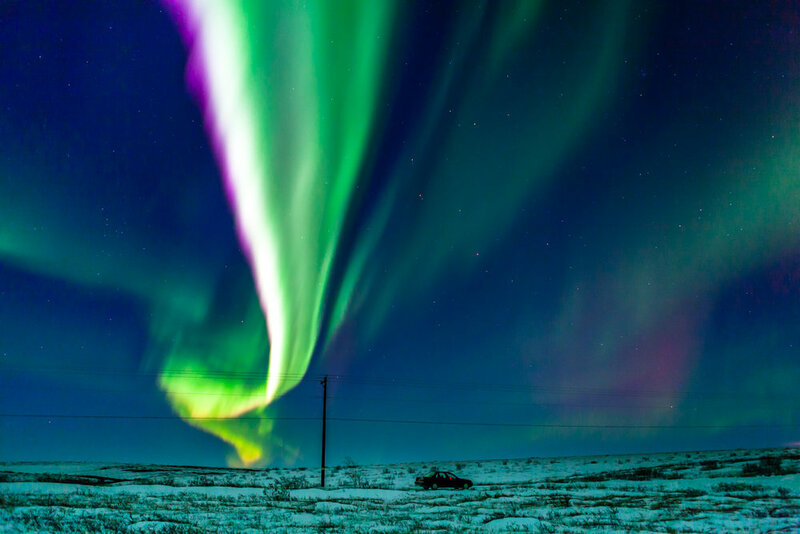 The arc of the earth near the poles brings the stratosphere considerably closer to the surface of the earth which often creates the illusion that the solar winds are right on top of you--a far cry from the auroras I have seen in distant latitudes to the south where it mostly seems to appear on the horizon. These images were made on a recent winter trip to Kotzebue during which I spent a couple of cold nights driving the icy loop road leading out of the village to the power station and wind farm that serves the village that is just above the Arctic Circle, an hour by air from Nome. I drove with a friend of mine in his 1991 Honda which he had had shipped from Hawaii by cargo plane when he first moved there so that he would have a safe way to pick up groceries and mail during the nine months of winter. On this particular night we kept the little car running even as we ventured out into the tundrabecause the risk that it wouldn't start again was too great. The temperature was often 20 to 30°F below zero without wind and a break down could have quickly spiraled into disaster--even that close to the village. Some nights the aurora was so bright we could drive without headlights. On the night I made these pictures, I was attempting to photograph fog banks rolling in from the open ocean off shore, and I happened to turn around for a moment just when a particularly bright aurora was heating up and I fell in love with the juxtaposition of that battered little capsule of a warm car that was our safety in extremity and the drama of the solar winds penetrating the atmosphere.